Home > Armed Forces Organizational Guidons > U.S. Air Force Guidons > USAF Mini Guidon 9" x 12"
USAF Mini Guidon 9" x 12"
These miniature U.S. Air Force guidons measure 9" x 12" and feature a fully embroidered eagle and unit designators on one side and are made from a special "No wrinkle" nylon fabric. We hot knife the flag edges to create a smooth finish that is perfect for framing as there are no raised hemmed edges to lift the matting. These guidons can be finished with the "swallowtail cut as pictured or they can be finished in a rectangular shape so that your framer can cut the swallowtail from the frame mat. These small scale USAF guidons are made specifically for framing and not suitable for flying. These very attractive "Framers Choice" mini USAF guidons are a popular option for awards, presentation gifts, and retirements. We can also frame these guidons for you; visit our Framed Guidons section for more info. Please enter your unit designators in the blocks provided above. Unless otherwise stated by customer, we will format the unit info to fit in the space above and below the eagle. 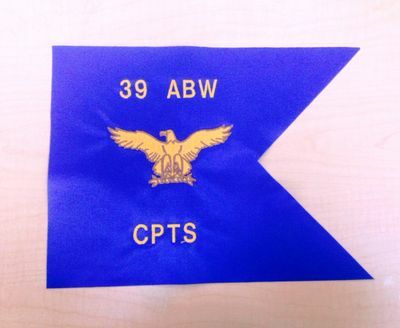 Please allow 2-3 weeks for shipping as each and every guidon we make is custom made to order. There are no refunds on these custom made guidons. In case of defect or error on our part, we reserve the right to replace the item or offer store credit. Returns must be approved by us prior to returning any custom items. RUSH shipping now available. Item/s ship within 10 days when this option is selected.